A week-long harbor strike at the Ports of Los Angeles and Long Beach, that nearly caused total port closures, ended this Wednesday. 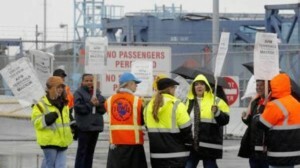 Even with the harbor strike being ended there may still be future issues for major U.S. ports. The shipping world is changing, and the ports need to keep up or be left out. Expansions of the Panama Canal are being done to accommodate the new ships being made, that are much more massive that previous models. This, along with better coordination between shipping trucks and trains that make overland journeys cheaper could mean bad news for ports in the upcoming years. As early as 2015, the way that goods are shipped in to the world’s largest consumer market could be completely altered. The biggest part of the changes is the Panama Canal being widened. Once this expansion is completed, in 2015, bigger ships will be able to cut their travel time down from the ports in Asia to the east coast of the U.S. and also for ships going to Western Europe by using the canal. Adaptation is key for the ports that plan on competing in this environment. There must be changes made to allow the bigger ships to dock, improving communications between trains and transporters, and port efficiency. Dredging is done to deepen harbors and waterways, which would make it possible for these massive ships to dock in port and to load and unload merchandise. Without dredging the ports they wouldn’t be able to accept these ships and would be unable to adapt to the changes coming to the shipping industry. The ports of Miami, New Orleans, Jacksonville, Charleston, Savannah, Baltimore, New York, and New Jersey have been working to adjust to the changes needed, and are working to deepen the harbors to allow for these new ships. Many ports are working on improved communication and coordination with trains and transporters to improve efficiency. Currently North American ports handle 24% fewer containers per hour than Northeast Asian ports, 18% less than Middle Eastern ports, and 11% less than European ports. Increased coordination between trains and trucking companies has caused cross-country overland shipping to become faster. Even with this better coordination the west coast will feel pressure to keep up once the canal expansion is completed. Moving cargo by ship is much less expensive, and with the time it takes cut down will make it more difficult to make overland transport worth the expense. The west coast will have to rely heavily on shipping by train, which can save about a week of time on the transport, to compete with the canal. Canada and Mexico are taking advantage of overland shipping by steering ships into their own ports and shipping the cargo into the U.S. by train, bypassing U.S. port taxes that support the harbors, which is only more competition for the U.S. harbors.